I am standing on a street corner in the downtown Reykjavík in front of an old two story house. Snowflakes are flying to my face when I dial a number on my phone with frozen fingers. It is May. You really never know what to expect of this world’s northernmost capital city. Soon the green door opens and I am greeted with a wide smile and a warm hug. 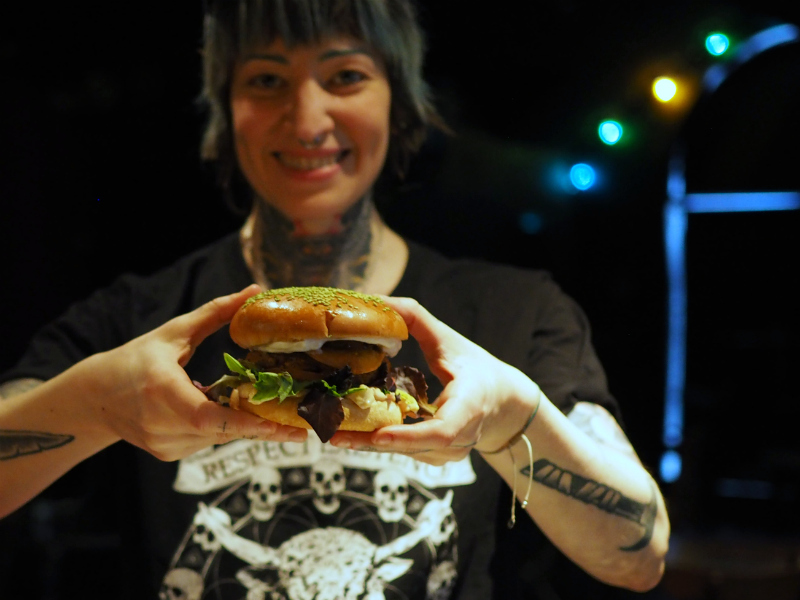 Linnea Hellström, a chef and power house of Icelandic vegan scene, takes me upstairs. 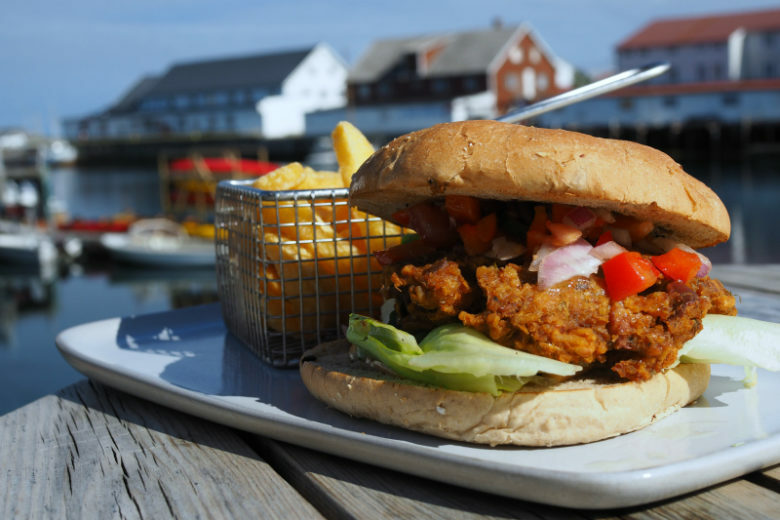 There is a bar and music venue called Gaukurinn – and soon also a vegan diner, Veganæs. We pass by a big blackboard with golden frames, stating in bright colours “We welcome everyone except for assholes such as racists, sexists and homophobes. We want everyone to feel respected and safe.” Hell yeah! Very soon it is clear to me that as a burger fanatic I have come to the right person. 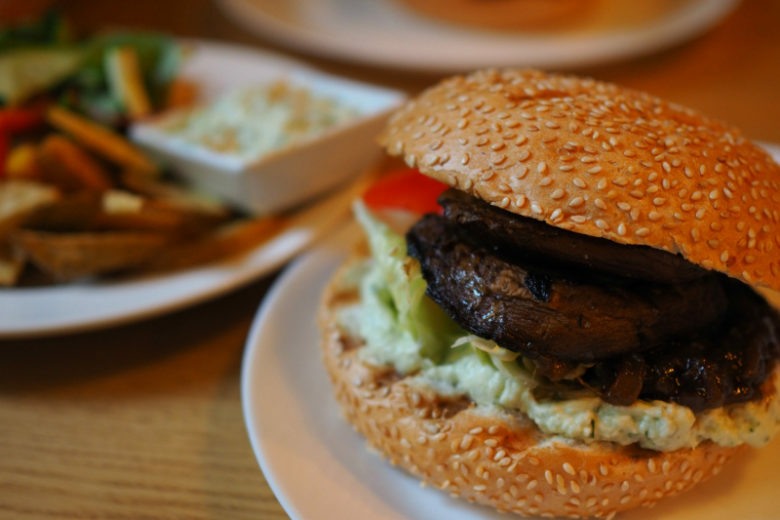 “The burgers are fascinating to me and have been an obsession in many periods of time”, Linnea tells enthusiastically behind the counter of the Veganæs while putting patties with her homemade cheese, Gyðja, into the oven. Linnea is originally from Sweden, but has lived also in Mexico and Spain before settling to Iceland. Her quest after the perfect burger started when she was around 10 years ago. 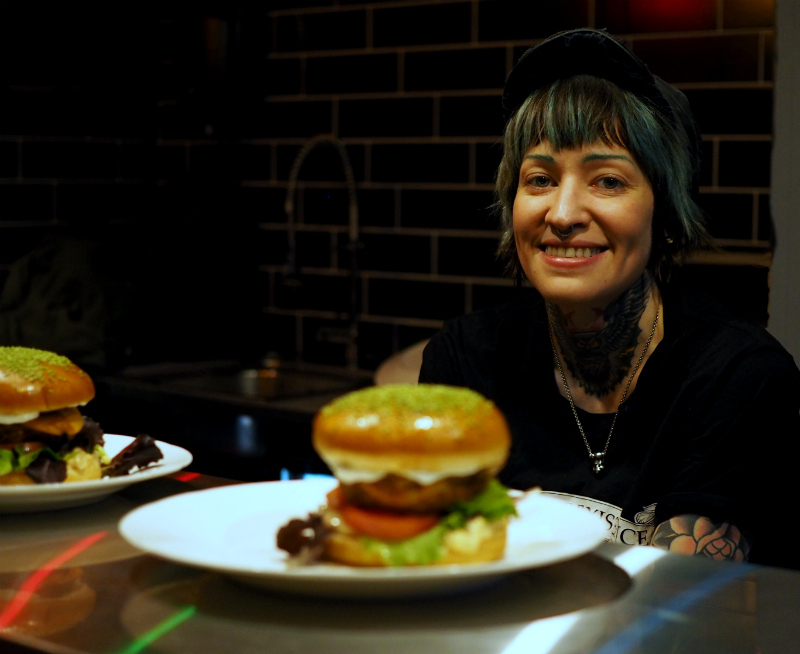 She was working in a vegan restaurant Cat Bar in Barcelona, where vegan versions of meaty foods were served – including burgers. “Biggest risk with me in the kitchen is to go all over the top, wanting to do all the craziest things. Sometimes you can actually stop at some point and be like, this is great, we don’t need to go crazier“, Linnea laughs. She puts the burgers together and brings them to the table. 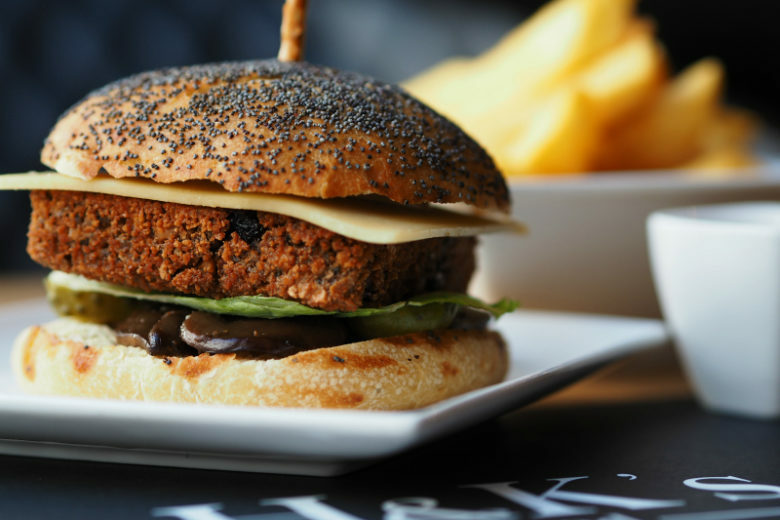 The delicious looking burger is one of the dishes that have made its way to Veganæs’ menu full of cruelty free comfort food. There is hamburger sauce with pickles, onions and jalapenos. 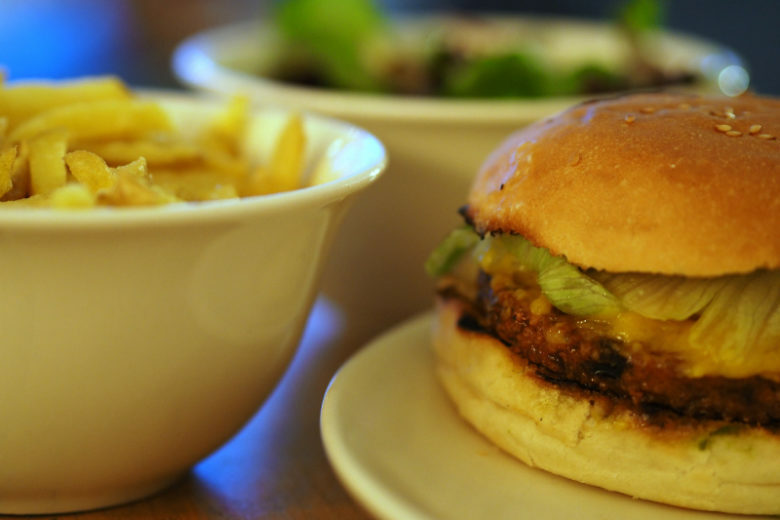 The patty is seitan and has a bit of sweet corn in it. The heart shaped Gyðja cheese is the plain version, Linnea makes them with many different flavours. Then there is lettuce and tomato, caramelized onion and garlic mayonnaise. 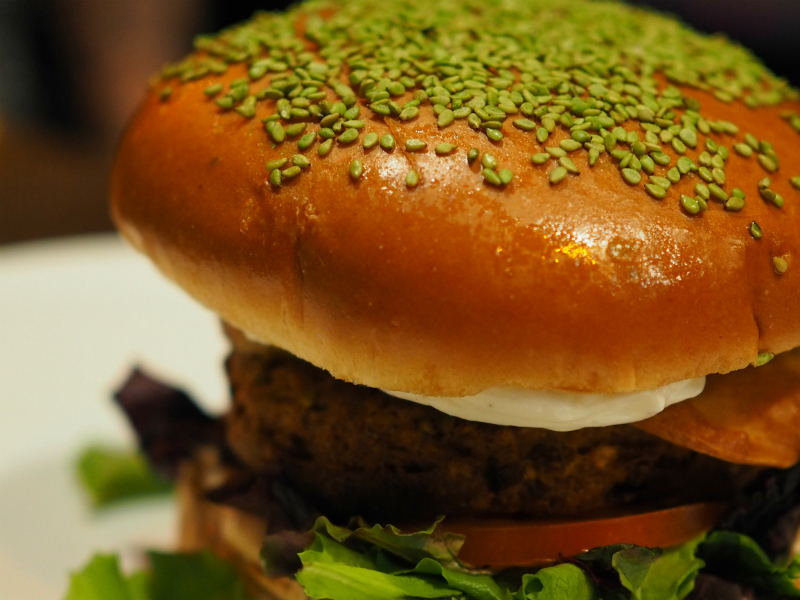 For a little extra kick, the bun is covered with bright green wasabi sesame seeds. It looks crazily yummy. I take a bite and fall in love right away. I have sauce all over my hands but I don’t really care. This burger is one of the best I have had. Meatiness of the seitan, sweetness of the onions, the amazing sauces. It has it all! I am definitely not complaining. I am ready to hear, how this vegan heaven has come together. When Linnea moved to Reykjavík in 2012, she felt instantly home and happy, at peace. Only one problem. There wasn’t much vegan food to be found on this remote island. “Instead of being bumped out of not being able to go anywhere to eat, it made me really hungry to try to make something happen. Since then I have been everywhere, where they would let me into their kitchen and mess with the menu”, she tells. 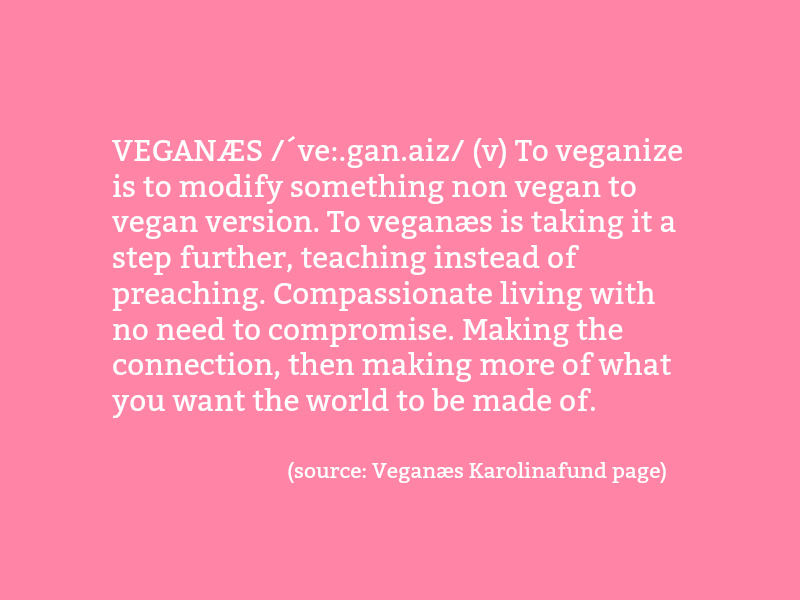 Veganæs means veganizing in Icelandic and that has been Linnea’s mission when living in Iceland. 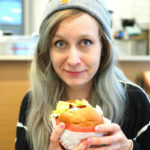 Linnea has for example worked in numerous kitchens in Reykjavík veganizing parts of their menus, organized many vegan events and also run a Mexican food truck. Couple years ago Linnea started to work in the kitchen of newly opened café and record shop, Kaffi Vinyl. She managed to convince them to veganize their whole kitchen. It was January and the Veganuary was in full swing so it was a good time to try. 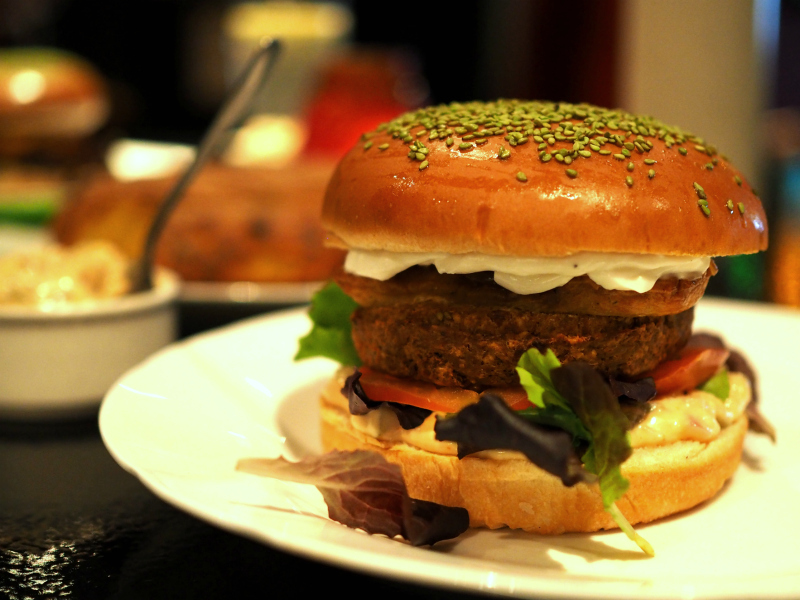 The owners saw that the timing was right and sticked to the vegan concept also after that month. In Kaffi Vinyl Linnea started to work with Oumph!, a Swedish soy based product, that had just landed to Iceland. Popping the Oumph in the menu and running the first vegan kitchen in Iceland caught the momentum and got quite a bit of attention. That is how the company Oumph scouted Linnea to work for them. “I sort of knew right off the bat I am not this big corporate grand scale product developer type of person. On the contrary, I am very much a little do it yourself, all the love inside every little thing kind of person. But it still felt totally worth the while to try out, see what it was about.” For around one year she worked with Oumph, traveling around, collecting new impressions and creating four new flavours. The first and best friends Linnea made in Iceland were artist and painter Örn Tönsberg and Linnea’s life partner, musician Krummi Björgvinsson. Now these three artists are running the Veganæs together. The people were there, the time was right, the idea of the restaurant was clear but the roof was still missing. Gaukurinn, soon also the home of Veganæs. The owners of Gaukurinn, Starri and Sólveig, went vegan last Veganuary and then it was clear. Veganæs had found its home. Linnea took business courses to see what is possible when you have not much capital but a really good idea. “For someone who is crazy workaholic that has no real business savvy”, she adds smiling. Linnea, Örn and Krummi decided to do a crowdfunding campaign last spring. “None of us had ever done a crowdfunding before. We all felt awkward and uncomfortable”, Linnea laughs. Linnea says she is not a very showy person, but that for the right reasons she will reach out. They got a lot of attention for the crowdfunding, also in media, and the hard work paid off. 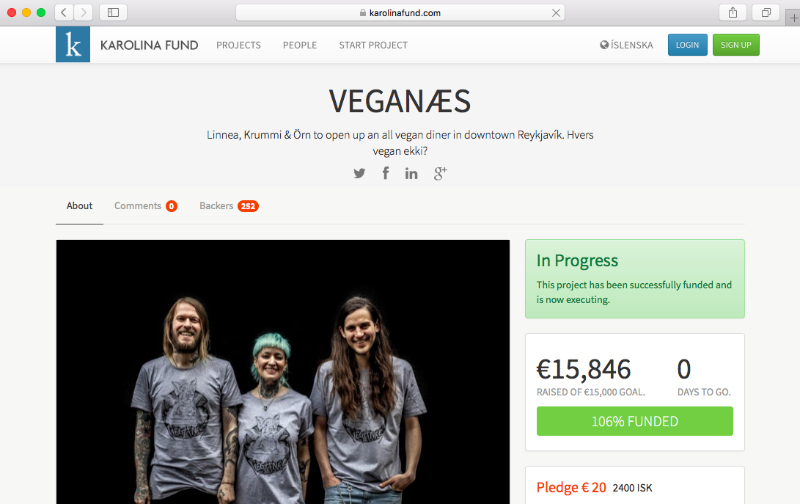 260 people donated and Veganæs managed to collect a bit over 15 000 euros in around one month. Karolinafund is an Icelandic crowdfunding platform, where also Veganaes got its funding. Linnea, Krummi and Örn have been doing everything they can themselves to cut the costs wherever possible. Old house brings its own challenges when it comes to safety measurements. Also Icelandic bureaucracy hasn’t been quite ready to face a fully vegan kitchen and there has to be for example space to prepare meat – that will never be prepared or served in this restaurant. But in these times, when the tourism keeps booming and downtown Reykjavik is filled with hotels, having a platform like Gaukurinn has a special meaning. “It is important to do something preserving and upleveling with these places that are still around”, Linnea emphasizes. 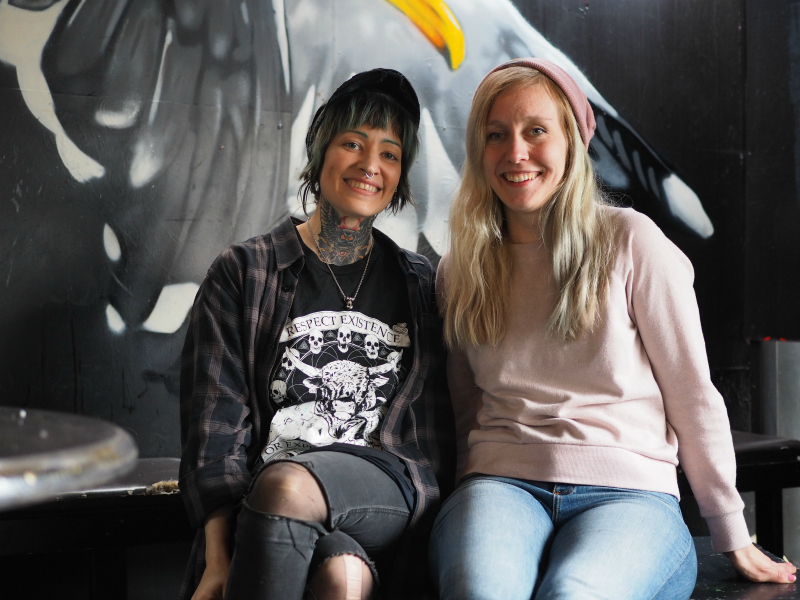 Their plans include that the place can host Reykjavík’s animal activism scene and bring people of different groups together better than before. 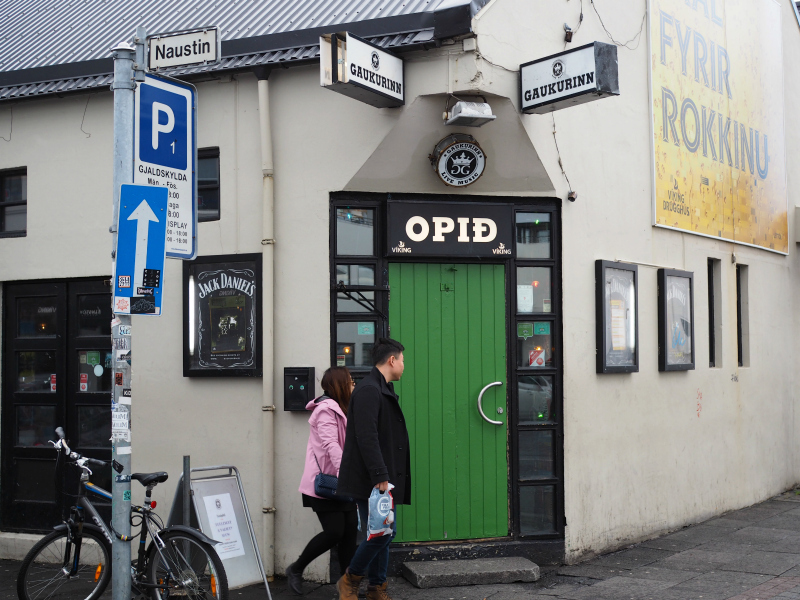 The place host metal concerts and over the last few years, it has become also the main drag show venue in Reykjavík. 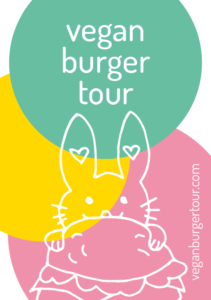 In addition, it is the home of most heartwarming burgers in a city, where it snows horizontally in the middle of May. EDIT: Yay, Veganæs has opened its doors on 9th of July 2018! You can find Veganæs in Tryggvagata 22, Reykjavík. Follow their Facebook page and Instagram for opening hours (and pics of mouthwatering comfort food).